I find it interesting how we (Canada, people, etc.) are supported or held aloft by the natural world in both these images and yet we may be unaware of this fact because the turtle is below the waterline and the 'fox' is hidden by the fold of the cover. The connection between the two runs deeper than the cover art though. 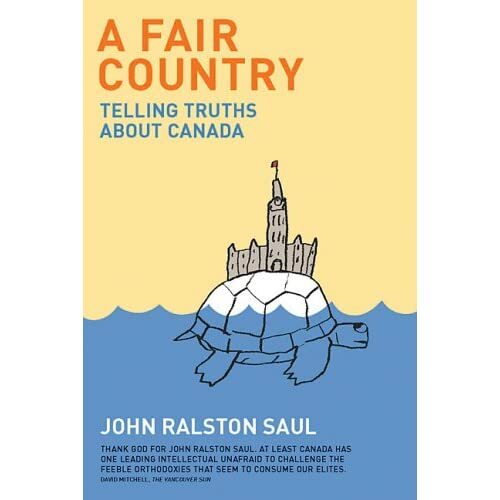 Saul's book is a wake-up call to Canadians to recognize that the organizational origin of our country is not Western Democratic, nor is "Order" a foundational tenet in Canada. He insists that Canada is instead a Metis nation, and that a nation of "Peace, WELFARE, and Good Government" was envisioned in our early years. But we've turned our backs on these facts and attemtped to emulate Britain and the United States out of an inferiority complex that has hampered our ability to succeed on our own terms - we need to wake up to this and embrace our true selves. Coincidentally, Treasury Library Canada begins with a wake-up call in "Knock Knock." "Knock knock, is anyone there?" sings Mark Hamilton as the song concludes, before "Piano Pieces For Adult Beginners" touches on the topic of being true to who you really are ("Don't try to be / Something you ain't") and not settling for/succumbing to simplistic motivations ("Don't do pride, don't do fate"). For this alone I think Mr. Saul may have found a suitable soundtrack to his public lectures on the book. Putting the links between Treasury Library Canada and A Fair Country aside, Woodpigeon's latest album is a worthy follow-up to the lovely Songbook from 2006. There is more of the fantastic layering of instrumentation used to build little walls of sound. To take my recurrent example; "Knock Knock" starts simply with guitar, then drums and voice but ultimately builds to a quiet cacaphony that includes strings, banjo and a chorus of voices. There are also clever song titles ("In the Battle of Sun vs. Curtains, Sun Loses and We Sleep Until Noon") and superbly sketched vignettes (the aforementioned song, for one: "And on those dark days when the sun won’t shine on me / I don’t want to have to quantify the ones I love"), that are held aloft (like the town on the cover?) 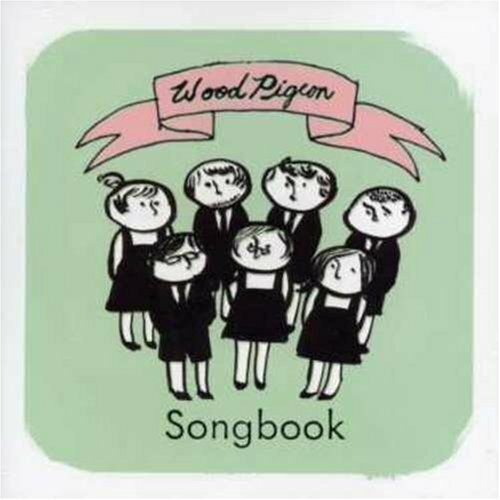 by the whimsical and wistful music made by the eight members of Woodpigeon. Plus "pre-requisite special guests" as the band pithily notes on Myspace. Unfortunately [not for the band, but for people looking for a copy] Treasury Library Canada sold out in its run of 1000 copies, but if you mark your Google Calendar for February 2009, Woodpigeon will be releasing a version of the album with a bonus disc in the UK and Europe if you absolutely-positively-must have a hard copy. AND it is available as a pay-what-you-want mp3 here. Speaking of mp3's I was fortunate enough to participate in a recording session at UMFM with Mark Hamilton last winter and he recorded a lovely, reverberating version of "I Want To See You Again." Don't forget to visit Woodpigeon's website, Myspace page, and the CBC3 site. Bowerbird much? That's the question posed to me yesterday by a friend and the answer of late is 'indubitably.' Hymns For A Dark Horse was a slow-burner for me - requiring several listens to digest the material, but over the last month it has absolutely caught fire. I can't stop returning to this record and I can't help but believe that when the group sings "you're in our talons now / and we're never letting go," they're speaking directly to listeners. This trio from Raleigh, North Carolina is comprised of Phil Moore (guitar, hi hat, lead vocals), Beth Tacular (accordion, autoharp, percussion, vocals) and Mark Paulson (violin, foot synth, percussion, vocals), and while it's Moore's vocals that will stand out on first listen, repeat plays reveal the complex relationship between the three that makes their material so compelling. One example: Paulson's violin echoes Moore's voice on "The Marbled Godwit" - neither possesses a traditional beauty, but the aching attempt to transcend their limits is my kind of gorgeous. Hymns For A Dark Horse was originally released in the spring of 2007, but the fine folks at Dead Oceans came to the same conclusion John Darnielle from The Mountain Goats did: "It is beyond stunning. This band is the complete package." And if props from friggin' John Darnielle isn't enough - the band is opening for Calexico throughout November (and seriously, if you live in one of the cities this bill is playing, why don't you have tickets yet?!). If you can get past the beautiful music this trio makes - and believe me, it may take several listens with a song like "Bur Oak" and the way their voices interplay on the chorus with Paulson and Tacular coming in above and just behind Moore to get beyond the song - close attention to the lyrics reveal some marvelous vignettes and address timely and timeless themes alike. I'll leave you with not one, but two fantastic videos that were filmed as part of La Blogotheque's "concert a importer" series (which is FANTASTIC - check out the Bon Iver stuff if you can - but I digress). The first is "In Our Talons," the lyrics of which I quoted in that first paragraph. The latter is the indescribably beautiful "Bur Oak." It'll be lodged in your head for days and I'm not sorry for that. Don't forget to visit their Myspace page and website.